I am in my late twenties and I am an active athlete. I play soccer in the fall and spring seasons. I play softball during the summer months. In soccer I have a 40 yard throw-in and I'm relied upon to take the throw-ins in clutch situations. In softball I play third base for a co-ed team where girls don't usually play the infield. I am also a coach for both sports plus basketball for middle school girls where I need to teach the basics of those sports. Next week (December 19th) I'm having arthroscopic surgery for the type 2 slap tear on my right shoulder. I'm curious that after surgery, how much will this affect my soccer game since the spring season starts in March? Also, how will this affect my coaching ability to show the girls the basics? Because you are active and it sounds like fairly healthy, by March you likely will be able to be playing, however, you may not be back to the 40yd throw in. Softball will be a bit longer if you are having surgery on your throwing arm. Every physician has a different return to play timeline after a SLAP repair, but the common time frame is 3-5 months for most sports, maybe a little longer for overhead throwers. As long as you go through a good rehab process and regain your motion and strength, you shouldn't have trouble with sports - it is just a matter of time. Hi - I am having surgery to repair both a rotator cuff tear and slap tear. My surgeon has put me on disability for a minimum of 6 weeks with the possibility of a longer time off depending on how things go. I am concerned both with the amount of time off work and the level of pain that is felt. Not to mention the difficulty in sleeping. I don't have a recliner. Any suggestions as to how I can get optimal recovery and fast healing as well as tips on sleeping? If you do not have a recliner, my best recommendation for sleeping is to try to use several pillows to prop yourself up in bed. Put several under your back, as well as propping up your arm while it is in the sling. It obviously won't be as comfortable as if you hadn't had surgery, but it should help. As far as being off work, what kind of job do you have? If it is a desk type job, then you should be able to return within 6 weeks. If it is a manual labor type of job, it will most likely be longer as you will be limited in your shoulder function. I would discuss your concerns with your surgeon and your supervisor. i am 3.5 weeks post op for slap tear and rotator cuff. last week i was wearing the sling with out the big cushion and had a reflex and my hand jerked out to the side of my body. hurt so bad for a couple minutes, spasmed for a couple days. kind of sore to the touch. shoulder still feels weird and unstable, and it did before i jerked it as well, not alot of pain unless i move it wrong. what is the likelihood i tore the repaired labrum or supraspinatus? how do i tell? 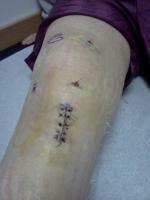 the further out from surgery you are the less likely you are going to damage the repair. 3.5 weeks should be getting you to the point were the repair is getting more stable. I would consult with your doctor for an evaluation and to let them know your concerns. They should be able to determine if everything is alright. I saw him today and he said it is very possible, but has only had one person tear cuff doing that but he reached out and caught a 5lb bag of sugar. My dr show little concern either way saying that we will know sometime over next month. if i tore the slap tear or cuff would i notice anything with the little range of movement i currently have. mainly pendulums. probably not - you likely won't know until after you regain more motion and start working on strengthening. Any type of sudden movement and pain is likely to cause a significant amount of muscle spasm, which creates more pain. usually it takes some time to calm things down, and then keep your fingers crossed and hope that all is well. Keep us posted. About 14 weeks post Slap Tear/Rotator Cuff surgery. I did not injure the repaired Labrum when i jerked my arm (1st post). i am now to the point to where i can do 75 pushups, i can do pullups, Deadlifts, Bench, etc (very light weight still) and it seems to be getting better every day. Still have some pain sometimes when i move my arm up over my head or out to the side etc, but i am very optimistic about the success of the surgery at this point.